Ald. George Cardenas (12th) advocated for the use of drones along CPS "Safe Passage" routes on Twitter Tuesday. "We could use the help. !” Ald. George Cardenas (12th) tweeted, along with an article from The Telegraph outlining ways the remote-controlled, unmanned aerial vehicles — commonly known as drones — have been used outside of military actions. “Why not use drones in safe passage.??" During a follow-up phone interview, Cardenas said "there is no doubt technology is migrating from military use. ... It's going to take time to find those uses in an urban environment. It is, however, the future and I think people will want to take that leap. I think eventually we’re going to have to look at this technology." But Matt Waite, a journalism professor at the University of Nebraska, believes using drones to patrol the city's streets isn't a good idea. Waite is involved in an effort that uses drones in news gathering and documents the experiments by the school's Drone Journalism Lab on a blog. "What happens if a camera catches kids committing crimes? Is that admissible in court? Do police have to get a warrant to watch these kids? Can you suspend a kid for acting a fool on their walk?" he asked. Add to that concern about restricted airspace within the city and its two major airports, and Waite said that's "a tall, tall order to overcome." “The technology could certainly be used to help keep children safe. Importantly, however, it is up to local leaders to determine whether this is an appropriate use in their community," said AUVSI spokeswoman Melanie Hinton. "Did 12th Ward Alderman @georgeacardenas just advocate that Military Drones be used on CPS safe passage routes?" tweeted Martin Ritter, a member of the Local School Council at Whitney Young High School and a Chicago Teachers Union organizer. Ritter later tweeted, "Flying tanks are not the answer." 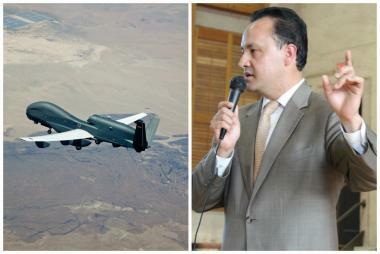 Melissa Lindberg said over Twitter that Cardenas "just proved he's unsuitable to hold elected office: drones in the city? Gee, what could possibly go wrong?" And another Twitter user said, "Interesting how there's willingness to spend on anything BUT schools." But Cardenas said critics weren't considering the non-military, public safety use of the devices. And he admitted he might've been too quick firing off his Tuesday morning tweet. "You know me, sometimes my brain gets ahead of myself. I read things and it intrigues me on the possibilities," he said. "It's a technology with a lot of potential and it could be really interesting in years to come. So yeah, I’m going to throw it out there."